NBC's 'Today', seriously condemned Billy Bush for his comments about women during the recorded conversation with Donald Trump. NBC says Bush -- who hosts the 3rd hour of 'Today' -- is suspended indefinitely. Executive Producer Noah Oppenheim said, "There is simply no excuse for Billy's language and behavior on that tape." 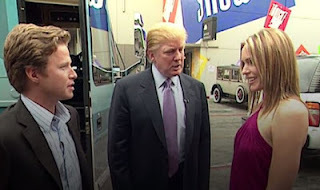 On the 2005 Access Hollywood tape ... Bush was heard talking to Trump about an actress moments before she escorted both men to the set of a soap opera. Bush said, "Jeez, your girl's hot as s***! The Donald has scored!!" Bush has apologized saying he was "younger, less mature, and acted foolishly in playing along" with what Trump described as "locker room banter." What can we say about Billy's suspension? Do you agree with it?